I love a good tablescape. Every year around this time, all the decor magazines and store catalogs come out with beautiful tablescapes for fall and the transition into Thanksgiving and I just get so happy!!! 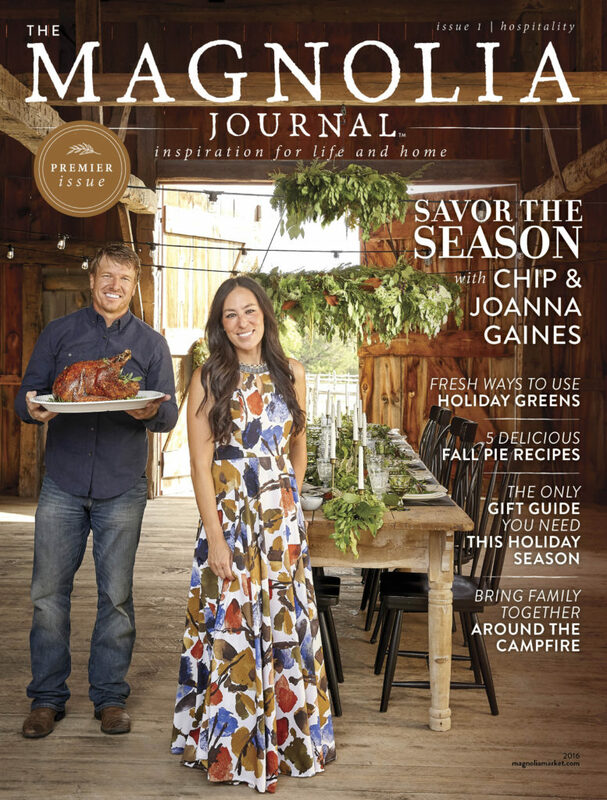 My most anticipated issue, though, is the new Magnolia Journal premier! Have you guys seen the cover!?! Shew. 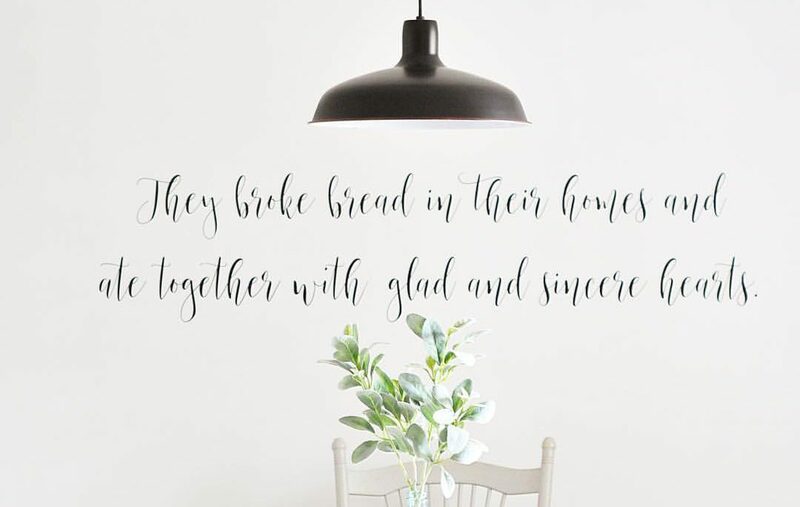 I think everyone here knows about my love for all things Fixer Upper, and I’m just gasping over that table and the decor. Every time I get on Pinterest, I see photos of the Magnolia Fall Gathering which you can read about here. These are some of the photos that, of course, Joanna Gaines had a hand in decorating. So I decided it was about time I got my own tablescape going in our house (albeit on a much smaller schedule) because, you know, it’s officially fall! Now, I looked at Pottery Barn, West Elm, Crate & Barrel… all of those have beautiful options for tableware, signs, centerpieces, wreaths! And they’re all going to cost you about… well, a lot. Let’s just leave it at that. I love to decorate, but I have to do it on a budget. So I decided to scrounge around and use things either I already had or pieces that can be easily obtained for very little cost to create a fixer upper inspired tablescape that’s perfect for this season! 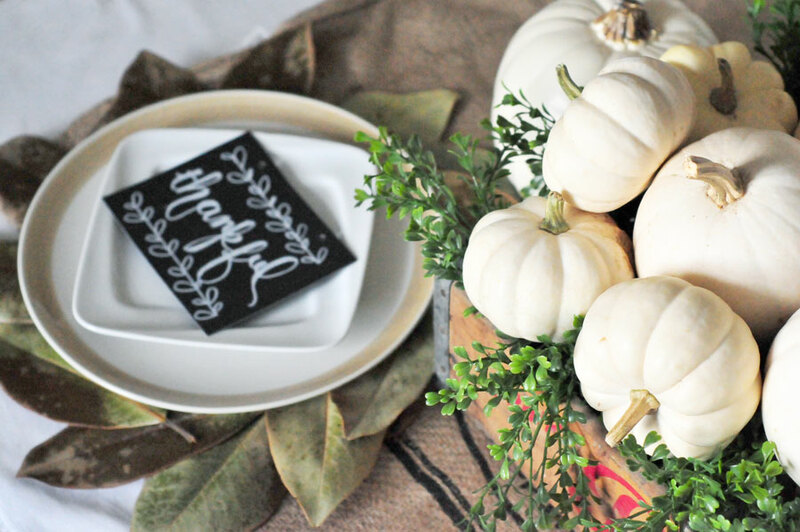 The entire tablescape cost me less than $20 and while you may not have everything on hand, you can purchase these items for low cost (or forage for them as the case may be). Here’s how you can get this look for less. *in some areas, you can get empty wine crates from Costco and liquor stores for free!!! *I just stumbled on this tutorial for making your own cotton branches! Check it out! Lay out your tablecloth, and use the coffee sack as a runner. If you don’t have access to a coffee sack, you can use a grain sack or even just a piece of burlap material from any sewing or crafts store. Set your wood crate in the center to hold the runner in place. 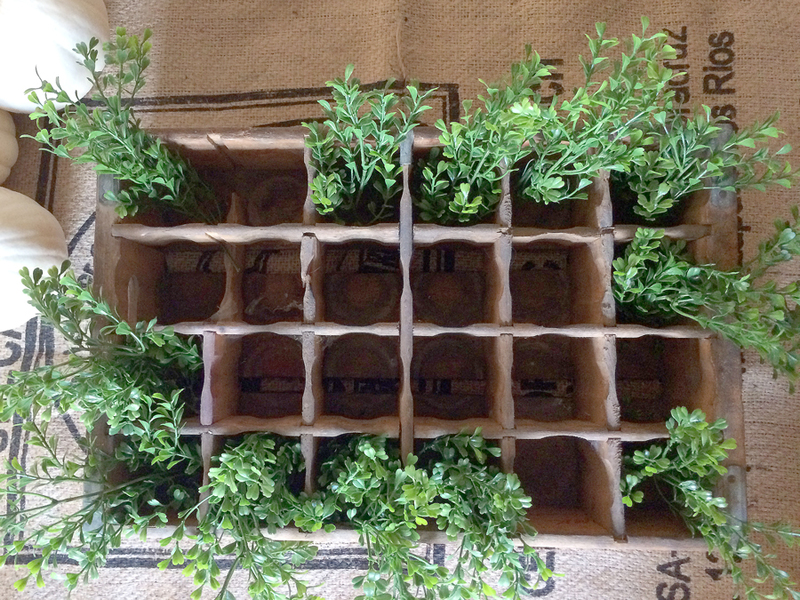 My crate was actually a soda holder so it had dividers built in, but even if yours doesn’t, just layer the greenery in around the edges letting it hang off the sides. There is no method to this, honestly, except to leave some set aside to fill in any holes later. Then comes the fun part. 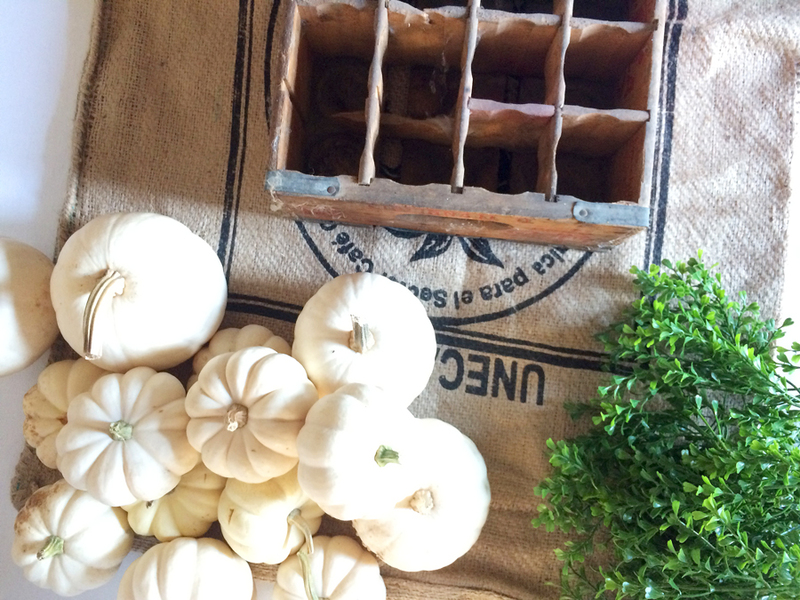 Fill that crate with as many pumpkins as you can get your hands on!!! I used mini pumpkins and small ones to give it a little depth and just piled them on. The messy look like they’ve just been set on there nonchalantly will come naturally as you load them in. Just be sure to leave some mini pumpkins to fill as many gaps as you can once your box is filled. I love the rustic feel of using a wreath as a charger underneath plates. 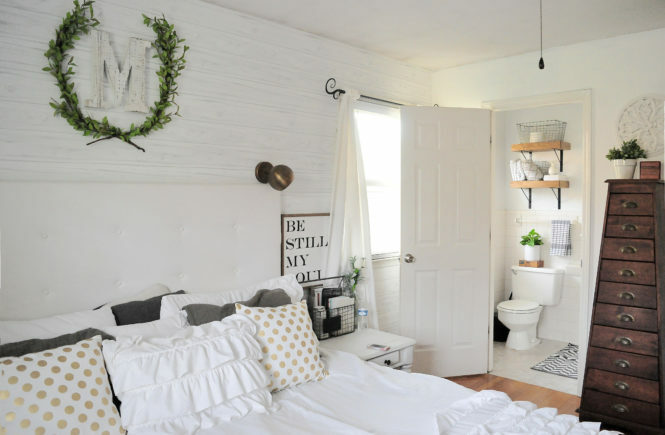 Anything with natural elements strikes my fancy anyway when it comes to home decor, so I knew I wanted to do something similar to the grapevine wreaths pictured in the Magnolia Gathering above. The only problem? I didn’t want to spend $20+ on wreaths. When all else fails, go outside! I had these dried magnolia leaves left over from a magnolia wreath that I made earlier this year (get the details here) and thought, why not use them as wreath forms under the plates? They turned out to be perfect, and the best part is you can customize the size of the “wreath”! Just lay them out in a circle then set a plate on top of them! 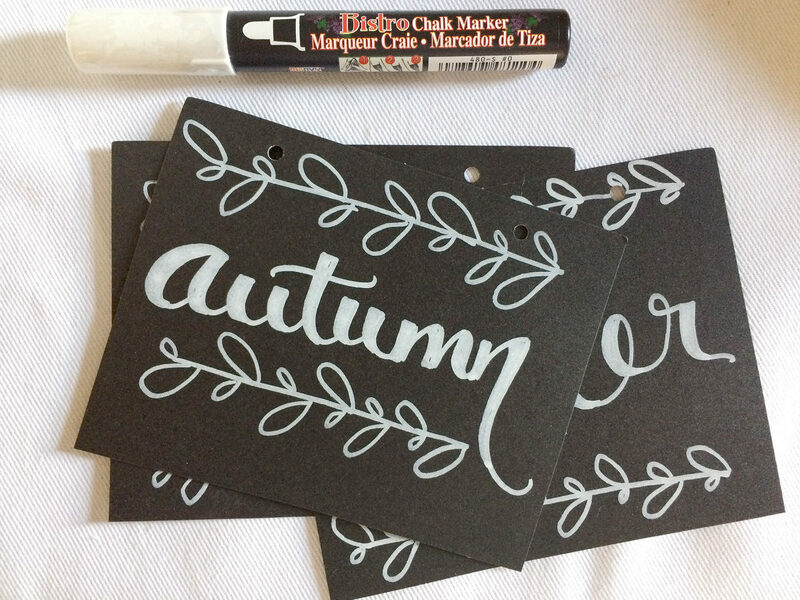 To add that finishing touch, I handlettered phrases that are significant to me for fall like “blessed”, “thankful”, “gather” and “autumn” onto the chalkboard cards using my chalk pen and added a laurel wreath design to the top and bottom. These can be customized for dinner parties to be name cards or hold other phrases of significance because the chalk marker erases with water! That’s it! 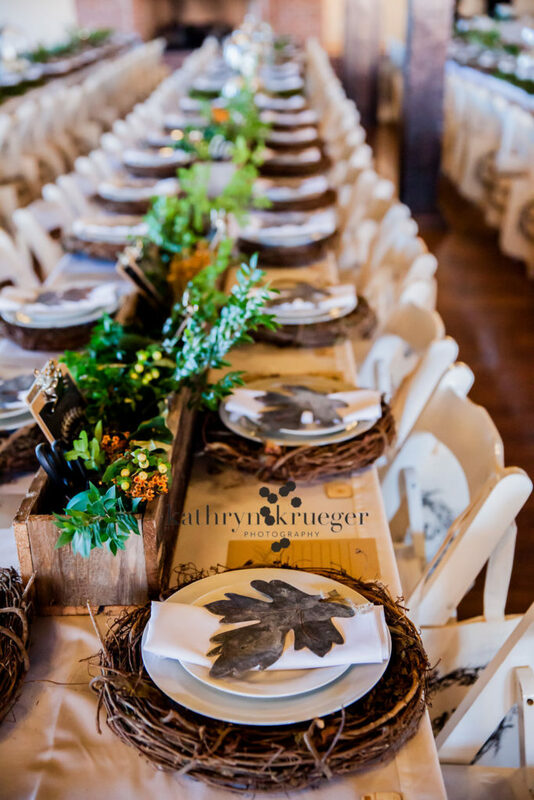 Just add silverware, glassware, stemware or any other type of ware you might need for your gathering, and you’ve got a beautiful fixer upper inspired tablescape for a fraction of the cost! Okay. Now can somebody please tell me when the next season of Fixer Upper starts back!?! I love these ideas and now I know what to do with the leaves from our magnolia tree ? Yay!!! They’re so perfect for decorating! I love the farm house style look for fall, it is so beautiful! Magnolia trees are just gorgeous! These are awesome ideas! 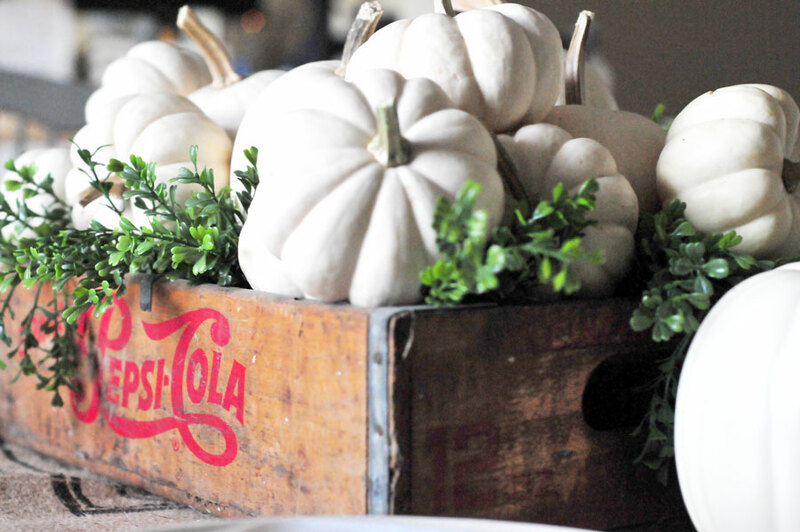 I never would have thought of using a soda crate to make a table centerpiece. I love white pumpkins. They are amazing! They make for the perfect table decorations! What an awesome tablescape! I love how inexpensive it is. I really need to up my game on home decor, this is beautiful! 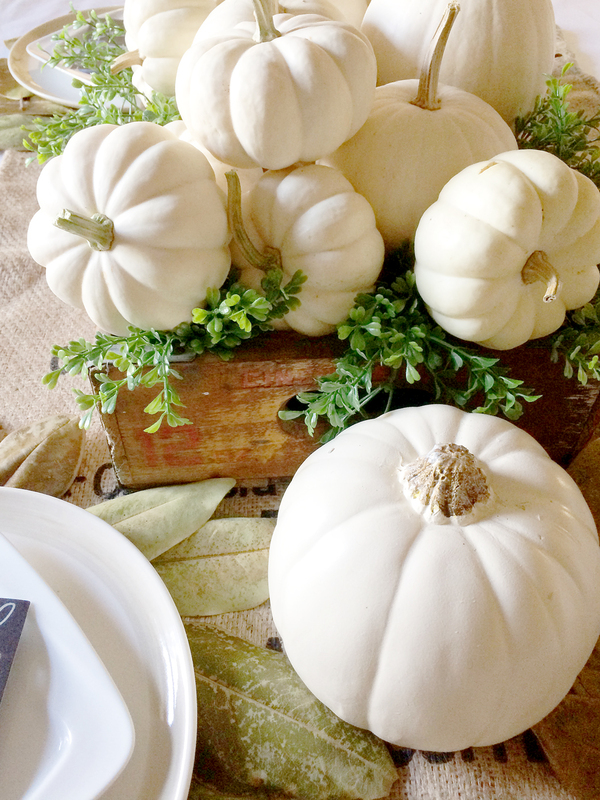 I love fall table decor, its so cosy and warm. Also, there are so many shops that cater for this – unlike summer decor. Love your picks! I love this! 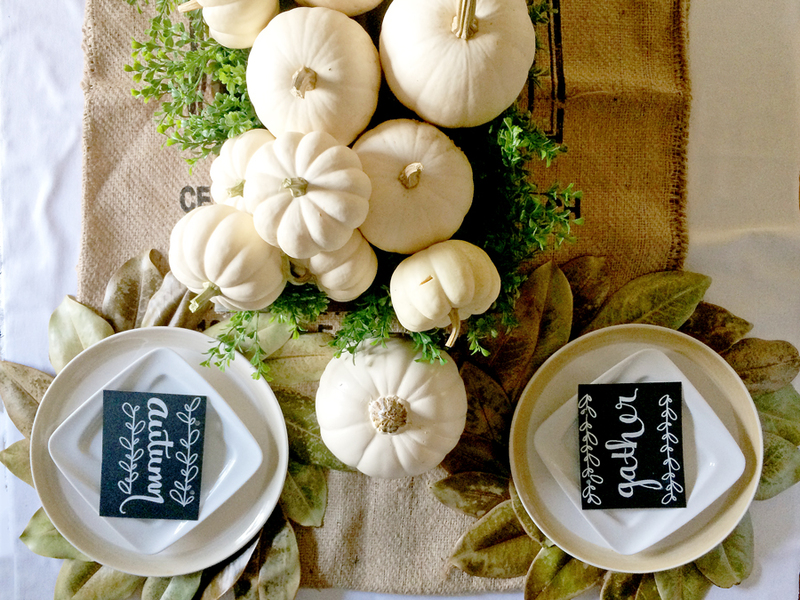 I am stealing a few of your ideas now for thanksgiving themed table! This is so perfect! Oh the Shiplap! Am I right? ? Love that show. These are awesome center pieces. I always have guests for Thanksgiving. I’m pinning this for later! 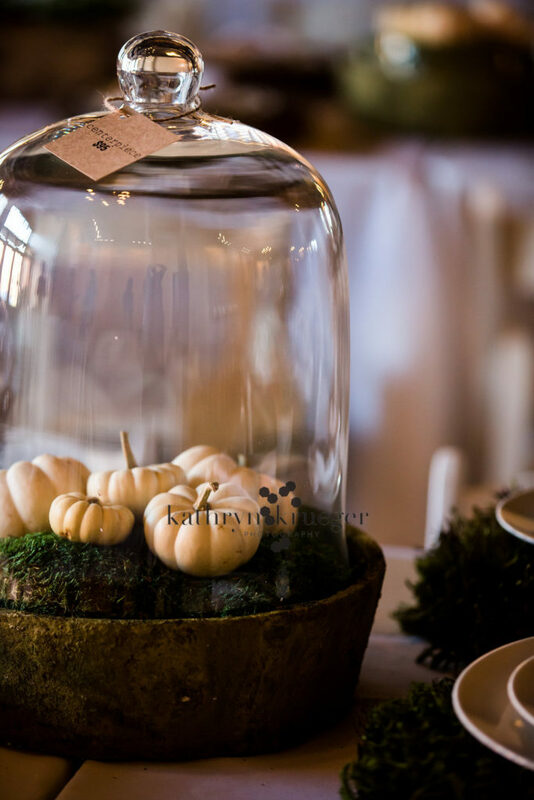 It’s a beautiful theme and what’s even better is that it will make the guests feel the warm welcome and the fall spirit as well! It’s really lovely, I can’t stop looking at the pictures! Wow, I super love this. 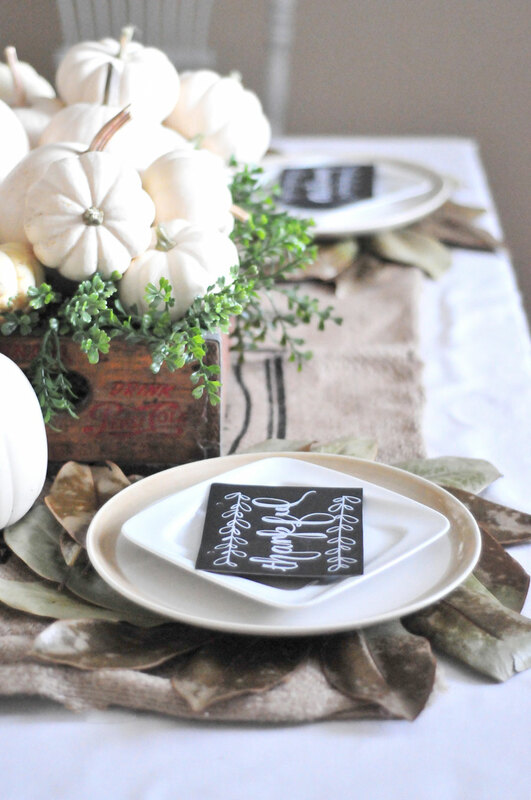 What a lovely theme, all is perfect for a fall-inspired celebration! Wow, what a gorgeous set up! I really love the combination of elements to make it so interesting to look at, and it seems like it’s a good level for the table so you aren’t blocking people from seeing each other. 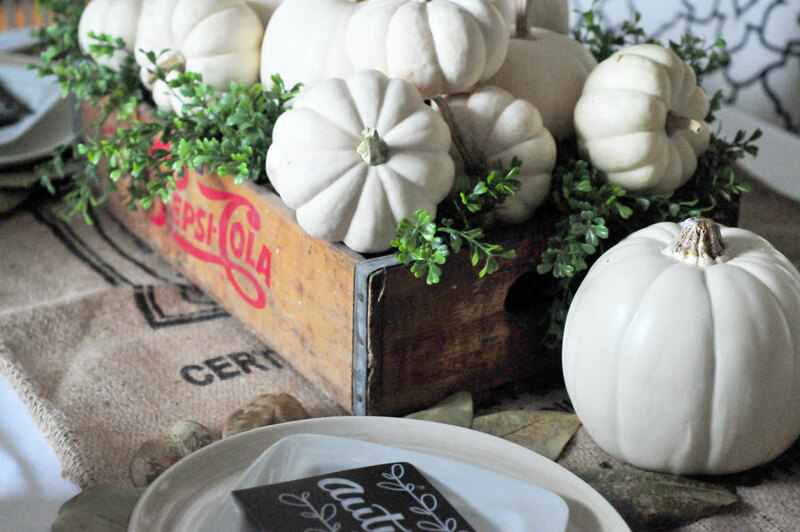 What is it about little white pumpkins that just spice everything up! I love the decor people come up with using them! I love your set up! Great job! This is so GORGEOUS! 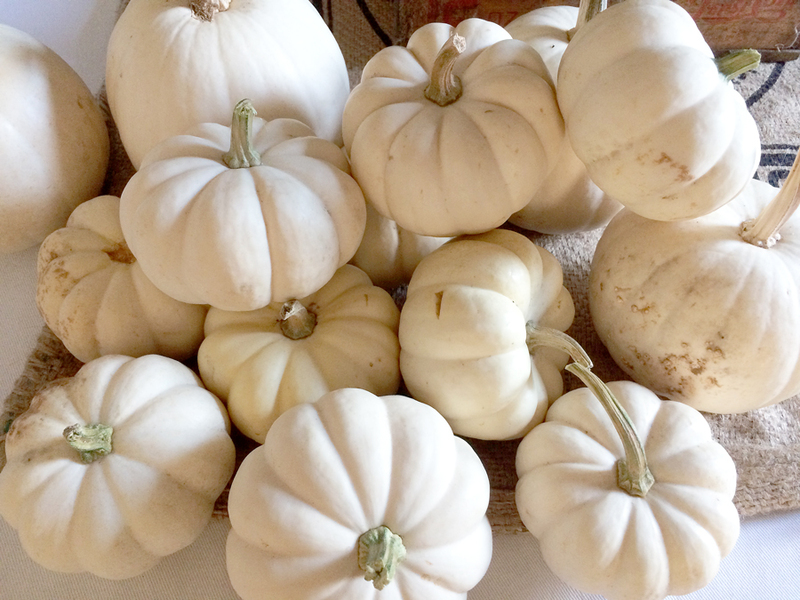 White pumpkins are my favorite this time of year! They’re so fresh and bright! So gorgeous! I love the way a tablescape sets the entire mood and changes the look of everything.